Let's get this out right now. The critics are wrong! OK with that out of the way here's my thoughts on The Legend of Tarzan. Spoilers to follow so if you have not seen it yet approach with caution. A brief text piece starts the film that sets up the film's historical background (King Leopold of Belgium and his "Congo Free State") before introducing us to Leon Rom (Christoph Waltz), the man in charge of leading Leopold's plans for Africa. Rom leads a safari to the diamond mines of Opar and a deal with its king Mbonga (Djimon Hounsou) is struck-diamonds to support Leopold's goals in exchange for one man-Tarzan aka John Clayton III (Alexander Skarsgard). Pressured by his majesty's envoys, Clayton agrees to go, taking with him Dr. George Washington Williams (Samuel L, Jackson) and his beloved wife Jane (Margot Robbie). Before too long though Jane is captured and Tarzan pursues her while coming to terms with his past and the animal within. Going into the film I tried to shut out the negative responses, naysayers and those who feel that Tarzan is an antiquated character and I am glad I did. In fact I'll say it right now, The Legend of Tarzan might be the best Tarzan film ever. It is certainly the most faithful to the works of Edgar Rice Burroughs, from flashbacks to Tarzan's past, making Jane a feisty American and even including references to characters like Mbonga and Muviro from the books. Director David Yates manages to keep things moving at a smooth pace, even when cutting to the past, delivering a surprisingly simple story that makes sense, something to be valued in this day and age of convoluted plot devices and character arcs that make little sense (looking at you Batman, Superman and Captain America). Yates also gets good performances out of his leads, with the big winner being Robbie, who brings smarts and charm to Jane Porter. She's also not a clueless damsel, as the character has been portrayed but a woman familiar with the jungle and a deep love for her husband. It also doesn't hurt that she's drop dead gorgeous. For his part Skarsgard is more physical in his performance, even though he handles the dialogue well and brings humanity to the character. Jackson has some great one-liners, even though if there is a nitpick, its that Waltz is somewhat underused as the bad guy. Or maybe it's just his scheme is somewhat familiar (or considering the real life Leon Rom was the reported influence of Kurtz in Joseph Conrad's Heart of Darkness, something more sinister or even crazy might have been welcome). As a Burroughs fan I guess I could nitpick some of the changes-like the fact that Mbonga's tribe is living in Opar, a reference to losing a child by John and Jane and some of Jane's backstory-but otherwise it's close to the characters and is reminiscent of plot and drive of The Beasts of Tarzan (with Tarzan having to rediscover his wild side). There are references to even past film versions (the best is Jackson doing his own spin on "Me Tarzan, You Jane"). Sure it has flaws but in the end the movie kept me entertained and that was all I wanted. Burroughs fans and just regular film goers will I think enjoy this. So ignore the negative press and go see it. Rating: **** out of 4. Thanks. Not too many spoilers. I have to ask: that reference to a lost child - is it left open, or is it made definite that the child is dead? I mean, does it sound as if it could it later be turned into the Korak story line if the movie gets a sequel? (Doesn't look good now, but you never know). If it is left very vague or if there is something like they had a boy who went missing and is thought dead or even that he went missing and later a badly decomposed body was found and they think it was him, something like that could still be turned into ooh, we found new evidence, our child may still be alive in a later story. They mention the lost child but don't dwell on it or provide a definitive answer so anything could be possible. 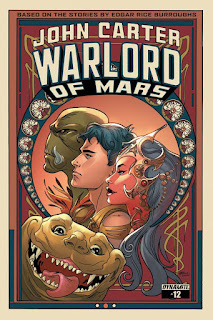 At least they don't cut back and forth like John Carter did to remind us that our hero is a damaged "hero." Best Tarzan film ever. At age 62 I have been a Tarzan fan since age 8. In third grade I was bored with the children's books they allowed us at the school library so my father dug out his original edition of The Beasts of Tarzan - the third in the series - and, coincidentally, apparently the inspiration for The Legend of Tarzan film. Burroughs wrote at an adult level of prose. It took me about a month to get through it, but by the end I was hooked. I abandoned child literature and went on to read a wide range of adventure fiction of all sorts. I have read almost everything that Burroughs wrote. Burroughs also inspired me to a life long commitment to physical fitness. (I run 7 kilometers a day.) The Legend of Tarzan captures the spirit and zest of the books like no other. A great film.